Simone Biles says it was a “relief” and “empowering” to speak out about being the victim of sexual abuse by jailed US Gymnastics team doctor Larry Nassar. In January 2018 Nassar was sentenced to up to 175 years after nearly 160 women accused him of sexual abuse. Biles, 21, then told her own story of how she was one of those victims. “It was very hard but I figured out that if I can tell my story then it might encourage other people to tell theirs,” she said. Biles, who won four gold medals and a bronze at the Rio Olympics in 2016, said she wanted to speak out about the reaction to her revelation and her responsibility as a role model. She came back from a two-year career break to win her fifth US national title in August while wearing a teal leotard – the designated colour to represent survivors of sexual abuse. And she returns to international competition at the World Championships in Qatar this month. “I think it was very important to support the fellow gymnasts it had happened to and to speak up for what you believe in and say ‘I don’t think this is right’ and I hope I gave them courage to come out and tell their stories one day if they want to,” she said. “People do look up to me so if they can see Simone can be strong enough then hopefully I can too – and that’s the message I wanted to give. Ohio-born Biles says she was “relieved” after speaking out, after feeling “a lot of pressure” to keep the truth to herself for so long. Biles praised Judge Rosemarie Aquilina who sentenced Nasser, and she says he “got what he deserved”. “The judge was absolutely amazing on her part, so we were very proud of her, and it is kind of a relief because [Nassar] got what he deserved and he almost got as many years [in prison] as [he abused] girls. Looking beyond the World Championships in Doha, which run from 24 October to 3 November, Biles is focused on preparing for the Tokyo Olympics in 2022 and says that not being a “rookie” anymore means she is a mentor to the younger members of the squad – and has learnt to manage expectations. “I pushed a lot of things away because expectations are scary and I don’t want to be the one to hold all of them, but as I get older I just become used to it,” she said. I’ve been lucky enough to see Simone Biles compete before, particularly in Rio when she cemented her name in gymnastics legend. But I had never seen her perform this close up. There is no fuss with Biles. No ego, no entourage – unless you count her mum, Nellie, who tagged along for the incredibly laid-back interview. After an amicable split with her long-term coach she has a new coaching partnership and said recently she feels happier and healthier than ever. A lot of that she puts down to the 18-month break she took after Rio, a break where she swam with sharks, socialised like never before – and drank plenty of chocolate shakes! She’s improved on her nemesis, the bars. She reigns supreme on the vault and floor and has added improvements to the routines which won her gold in Rio, but she now has a new ambition – to make the individual bars final in Doha. Something seems to have just clicked. 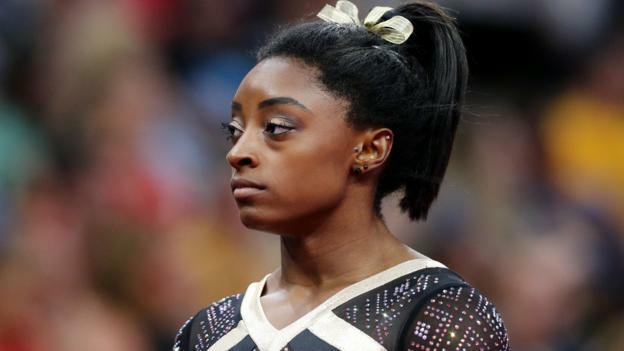 Yet despite Biles’ superhuman abilities she has always suffered with low self-esteem. As a huge Beyonce fan she recently said she wished she had the singer’s confidence. She giggled with that infectious smile though when I quoted lines from Beyonce’s track ‘Ego’ to her – “I walk like this ’cause I can back it up.” And boy, can she.